Summary: WCI’s seventeenth joint auction (Current Auction) has cleared for the sixth consecutive time at a settlement price of USD 15.31. The settlement price for the Advance Auction was 2-cents higher than current auction at USD 15.33. 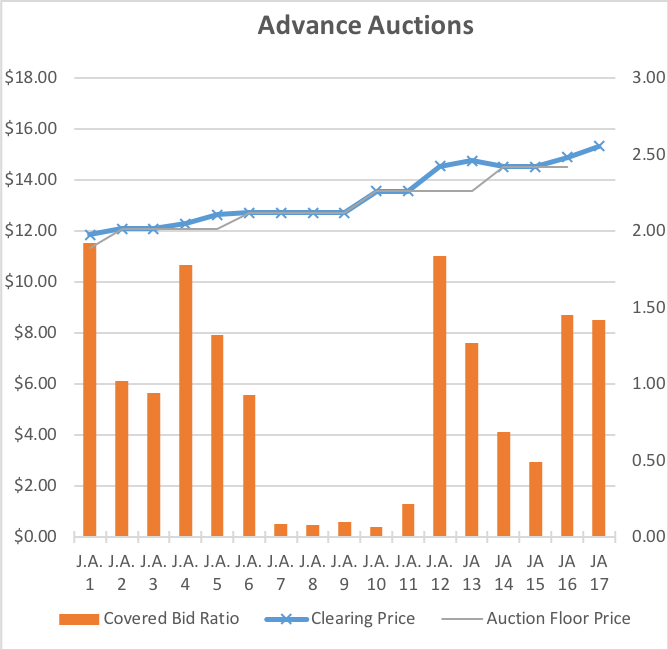 The current auction cleared with a bid-to-cover ratio of 1.17 and the advance auction cleared with a bid-to-cover ratio of 1.42, with 84 qualified bidders (64 from California and 20 from Quebec). The current auction cleared a full 78-cents above the current floor price of USD 14.53. All 78,825,717 allowances on offer in the 17th Joint Auction (Current) cleared at USD 15.31 with a bid ratio of 1.17. The Advanced Auction also fully cleared with 9,401,500 allowances at USD 15.33 with a bid ratio of 1.42. The full subscription indicates that market is continuing to gain momentum as we see AB 398 regulation start to take shape. 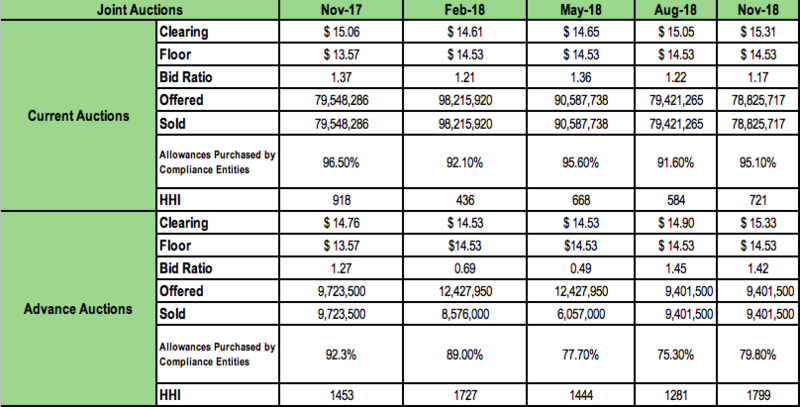 The settlement price of current auction this time around is 26 cents higher than last year’s settlement price indicating that market has positive sentiments as it’s heading into the next part of Compliance Period 3. CCAs have also been trading significantly higher than floor price and have been going up consistently. As auction cleared at a lower price than CCAs are currently trading, we might not see Secondary Market prices moving in the direction of auction clearing price as we have seen in the past. As the dust settles from Ontario’s de-linkage, CA and QC’s demand for allowances assures that the cap-and-trade program continues to incentivise entities to take part in a cost-effective GHG emissions reduction program. 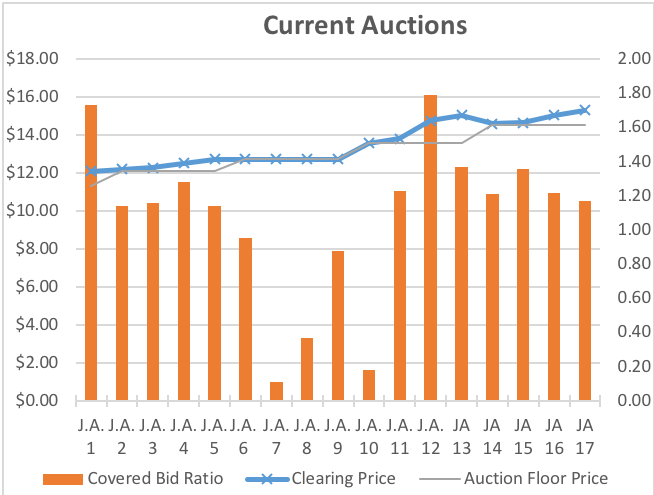 The Advanced Auction also showed strong results with all 9,401,500 V2021 allowances on offer clearing at a bid-to-cover ratio of 1.42. The interest in future allowances reflects the eagerness of traders to start securing positions for future compliance obligations. CC.info will be releasing a deeper statistical breakdown of trends and observations from the latest joint auction in our After-Auction Review. For more information about CaliforniaCarbon.info’s comprehensive Auction Data Suites, please contact contact@californiacarbon.info.